← Want to see what a Michigan republican party-backed $195-million Taxpayer funded bailout of Detroit gets you? Thank you for the reminder regarding this year's (unbelievable) HB5097 "..exempt law enforcement and fire department employees from a 2011 law that banned automatic seniority-based automatic pay hikes for individual government employees (“step increases”) during the time when a government employee union contract has expired and no replacement has been negotiated..."
Both this bill and 2012's SB1129 "..issue pension obligation bonds with no vote of the people required.." were signed into law less than one month before crucial November elections. In other words, issues of corruption or even forced massive (were talking billions) taxation are 'laughable'' in terms of political consequences for those casting the actual votes. Elections are won and lost on these issues..we simply choose not to 'mention them' during elections. As a resident of Waterford Twp, deep in the heart of the progressive Republican Party and Oakland County, I simply lay bare the facts that support my claims that the state govt, the MIGOP, and many GOP players across the state are just plain crooked, ethically challenged and morally bankrupt. The facts are that our Police Chief was caught stealing political campaign signs that carried a message he was opposed to- almost 6 months ago. Kyle McGrath, a self-proclaimed Conservative, card-carrying member of the county party- as well as Executive Committee member of the party, complained that some of those signs belonged to him, and consequently, he had been damaged by their theft. Oakland Co. Sheriff and self-proclaimed Conservative, and former contestant for Governor, Mike Bouchard- whose duty is to protect the constitutional rights of all OC citizens, could not manufacture enough spine to do his job and kicked his responsibilities up the law enforcement food chain to an even bigger politician than he- and breathed a heavy sigh of relief. Half a year later, AG Schuette might be on duty, and a lawless police chief continues to remain on paid vacation. Many stare at me in disbelief when I'm unimpressed that 5 House Reps from the grassroots got elected to enter the snakepit in Lansing. Perhaps that's because I have spent far more time in Lansing than the 5 combined- as an unpaid citizen lobbyist, regularly playing defense against "Republicans" and their progressive policies, programs, and partners in crime. In other words, I've been spending way too much time working directly against the team they joined. For the record, I was not re-elected to the Executive Committee- the local tea party people voted against me because I wasn't deemed sufficiently pure, and instead they choose people who were committed to going to their meetings. It is true that all the signs belonged to me- I put up 20 opposing the parks millage (at the cost of $99, which was all that I was legally allowed to spend under MI campaign finance laws) and the next day every single one was gone, while no others were taken down. The video from the police cruiser that caught McCaw clearly shows the chief of police in the middle of the night in plain clothes pulling one down, which was on the other side of the sidewalk away from the road and next to a bush, and then getting in his car to drive off, while not touching the police millage sign on the other side of the bush (sadly hidden in the video). As he only took down my signs, this means that my speech was targeted by a law enforcement official, and since my signs were removed, this means it was silenced- that means my first amendment rights were indeed violated. Liberals and conservatives and tea party people should be supporting me on this one. For the record, I do have a legitimate fear that someday I will be retaliated against. McCaw knows where I live (he drove by my house and glared at my wife the day after my signs went missing), has firearms, and has cronies with firearms who owe their positions and power in the police department to him. The same night that my signs went down, my property was vandalized by unknown intruders. It is a reasonable expectation that something bad will happen to me and my family because of this. I can only hope that in the end justice, liberty, and freedom prevail. Huh? He and his cronies cronies have firearms? What? Well, then it's 'bout damn time you go out and get some too, puss-cake! Owning a firearm myself has nothing to do with it. It really won't matter if I have a firearm in my house if a disgruntled police officer, upset that I cost him his pension, approaches me and my family on the street or rings on our doorbell and guns us all down. Owning a firearm will not prevent my family from being killed. And neither is it wise to suggest that I get into a fire fight with the police. The right attitude is not "F#$% the police", as many libertarians and tea party people seem to think it should be and your comment seems to imply. I know this is the internet and all that, but it is important to approach these sorts of situations with maturity. OK, Mr. McGrath, exactly what is it that you are trolling for here? Was not your case stated crystal clearly in above post? Please, do tell all here exactly what it is. Because if I were placing bets, it would be on garnering sympathy. Sympathy for you engaging a unionized LEO system, which is beholden to their elected officials whose only concern is about maintaining their seat suckling the taxpayer teat, and you being clueless enough to believe you will not be challenged or, face repercussions by the aforementioned system. Am I on your side throughout this matter? Without question, however, I am beginning to wonder, why? Does my comment imply "F#$% the police" as you dare to assert? No. Not at all but, do take note of image in this post. Whether you choose to fully accept that as fact is your problem - not mine. Are there bad LEO? Absolutely. Are there functionally illiterate LEO? Well, .FEDGOV courts say it's a guaranteed employment qualification, and now SCOTUS says their "ignorance" is protected. Are there good LEO out there? Maybe. 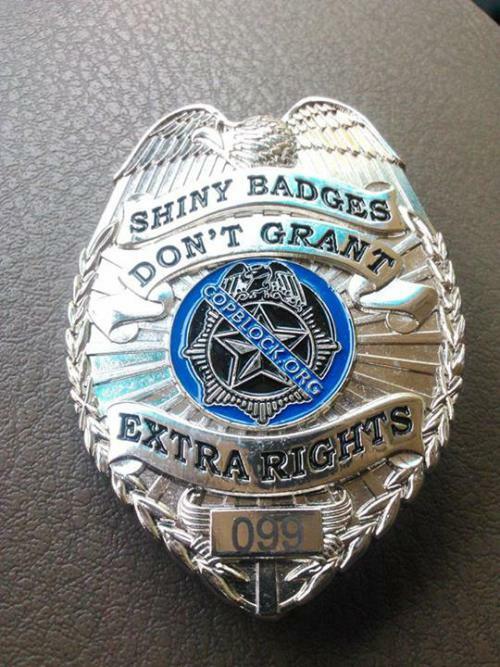 Maybe once upon a time when they were Peace Officers who are not what they have become now due to Law Statutes as written, which has transformed their role into little more than a revenue collection agency for funding their pensions within the layers of governmental bureaucracy with budgets teetering on bankruptcy. And, again, yes, it's a thin blue line for the "brotherhood" when placing their wagon circling union membership under scrutiny. And, yes, Mr. McGrath, I do realize this is the internet. I also recognize that a drive-by "glare" shot at someone as to somehow equate to an entire "family being killed" with that being fantasy, which does not rise to anything considered maturity. Are you the thought police now? Is your solution to incarcerate all those with scowls on their face who happen to have a beef with you, imagined or otherwise? If so, perhaps you should invest in these, and stay away from firearms to protect yourself or, simply call 911 . I stand by my original response to you.